Ethiopia has experienced one of the worst civil wars in Africa; the shortest one lasted for seventeen years before it brought the current ruling party to power in 1991. Before the rise of Kassa Hailu of Quara as Emperor Tewodros II in the second half of the 19th century, Ethiopia was consumed by war between contending feudal lords. However, none of the wars were ethnic-based in nature. Yes, the dominant political force in the ruling coalition, TPLF, projected the seventeen years guerrilla war during the Derg era somehow as an ethnic war which was not the case as far as the then government is concerned. Recently, Ethiopia is experiencing a civil war like ethnic conflict. In the past few weeks, an estimated 150,000 oromos are reportedly displaced from the Somali region of Ethiopia after the regional government in Somali deployed special police to cleanse Oromo speaking Ethiopians from the region. At last, fifty are killed. The origin of the conflict is said to be a dispute over land (the two regional governments and the Federal government itself rather employ the language “border conflict”). Yet, there are rumors that the Somali regional government is agitated by Tigray People’s Liberation Front government. In fact, in recent years, Somali regional government and Tigray regional government seem to be acting like allies more than any of the other regional governments. The rest of the regional governments are somehow challenging the privileged status of Tigray and the TPLF party in the ruling coaltion. It is now apparent that the development in Somali region is causing political wranglings, to say the least, within the ruling party. Oromo People’s Democratic Organization (OPDO) is blaming the Federal government, implied in it is TPLF, for what happened in the Somali region. Speaker of the Federal Parliament, Aba Dula Gemeda who has been working with the men in power for more than twenty-six years now while serving within OPDO, reportedly submitted resignation letter in the last few weeks and the conflict in Somali region is cited as a factor in his decision to resign. One thing that need NOT be forgotten is that the ethnic conflict in somali region, with its apparent ethnic cleansing motive, is not the first major ethnic-based conflict in Ethiopia in the last twenty-six years nor it seems that it is going to be the last one. There has been cruel recurrent ethnic cleansing attempts in Oromia region itself for more than two decades now. Impoverished Amharic speaking Ethiopians with small subsistence farming have been evicted from their small land holdings with impunity. Many have been killed and thousands were displaced. Other language speaking groups were also targets of ethnic violence. But, at the time, the federal government not only opted inaction but also there were outright denials when thousands of displaced people trekked to the capital Addis Ababa. Similar ethnic-based attacks and evictions also happened in Benshangul region of Ethiopia. In Northwest and Northcentral Ethiopia, expansionist agenda by Tigray government ( and it has a tacit support from the Federal government the key positions of which is dominated by ethnic Tigreans) has caused ethnic tension. In the summer months of July and August, there was ethnic like conflict out of which the Tigray government created a melodramatic political situation. Ethnic Tigray people were reportedly displaced from Gonder region of Ethiopia ( in fact this became suspicious as there was the indication that intelligence units in Tigray government were involved in the drama.) However, there it is clear that there is enmity towards minority ethnic Tigray as they are seen as the power base and loyal supporters of TPLF regardless of the widespread atrocities that TPLF is causing to Ethiopians. With the existing ethnic sentiment, which at times tend to be a radical one, if a full-fledged civil war is to break out in Ethiopia in the near future, chances are it is going to be an ethnic-based civil war, than a religious conflict. The reason for the rather pessimistic view that ethnic conflict could engulf Ethiopia is related to the very nature of the system. 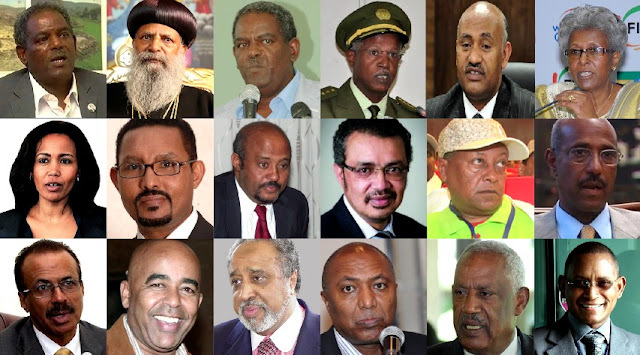 The minority regime manifested for a long time now insecurity about Ethiopian unity. It went to the extent of wrongly theorizing the clamor for unity as a chauvinist agenda, only to entrench minority ethnic Tigray chauvisim which caused unprecedented resistance that led the Ethiopia to the state of emergency in 2016. Ethnic-based politics is given government resource and structure (remember the current form of Federalism is ethnic based) but no meaningful effort is made to promote the importance of Ethiopia as a country for all ethnic groups in Ethiopia. The Economist, which has been a subtle patron of the regime in Ethiopia, with all its inaccuracies and flaws about historical background, dared to ambivalently call a spade a spade when it wrote, this past week, that the government emphasized ethnic identity at the expense of the unity of the country. For many years now, pundits were writing about Ethiopia being at the “crossroad” because of the policies of the administration in power. Some still tend to employ “Ethiopia at a crossroad” expression to denote the existing political problems and uncertainty about the future of Ethiopia. The truth is that Ethiopia is in a dangerous quagmire and sinking to ethnic conflict that is clearly detrimental to the stability of the entire region. Fortunately, even the quagmire could be a springboard to a critical juncture that is capable weakening the monstrous ethnic ideology and to piece the country together again the way it should be. Some three years ago, there was already a discussion within in the ruling coalition, at the Bahir Dar congress, to form a single united party. Then again, the dominant force in the coalition, TPLF, did not push for it the way it pushes other agenda that are of economic or political benefit to TPLF. Even with the rising ethnic conflict that is taking away civilian lives, TPLF is not pushing for restructuring the system in a way to serve the unity of Ethiopia. The reason is it still fails to arrest its insecurity about the Unity of Ethiopia. For TPLF, a strong and united Ethiopia is a threat to Tigray. If Ethiopia is to be recused from the impending ceaseless ethnic conflict, restructuring the ethnic-based federal system in a way to weaken ethnic conflict and promote the Unity of Ethiopia is imperative. And also TPLF need to understand that the idea of building a supremacist and strong Tigray at the expense of a weak Ethiopia that could always be at the mercy of TPLF is totally impossible.